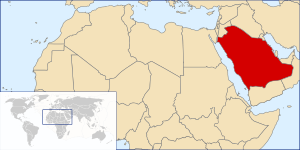 Saudi Arabia is a country in western Asia. It contains most of the Arabian Peninsula, including the Rub Al-Khali or "Empty Quarter," a notoriously empty part of the country. The nation is dominated by the Arabian Desert, and is very hot. The land of Saudi Arabia has many claimed by many nations; Saudi Arabia was a British solution to the breakup of the Ottoman Empire after World War One. Its cities of Makkah (Mecca) and Medina are important places for the Islam religion, as the prophet Muhammad lived there. Most of the people in Saudi Arabia are Muslims. The leading industries in Saudi Arabia, besides air conditioning, are oil and water, oil for exports, water for imports. This page was last edited on 2 May 2017, at 00:38.